“After a very successful 150th orchestral season in Bradford, St George’s Hall closed its doors to undergo an extensive transformation and refurbishment work has been underway since 2016. St George’s Hall reopens to the public this month, and I am delighted to announce that the first classical music concert in our historic venue will be the Hallé on Thursday 21 February 2019. I’m sure you’ll agree that it is very fitting that this is our first orchestral concert at St George’s Hall, given the very long history and association with what we consider to be our resident orchestra. The opening concert with the Hallé on Thursday 21 February is conducted by Carlos Miguel Prieto with the Hallé’s principal clarinettist Sergio Castelló López. The concert opens with Falla’s remarkably beautiful El amor brujo. The season continues with another concert from the Hallé on Friday 15 March. This concert is conducted by Tomáš Hanus and the soloist is winner of the 2018 Leeds International Piano Competition, Eric Lu. Czech conductor, Tomás Hanus, conducts Dvorák’s Scherzo capriccioso, bursting with Bohemian charm. Eric Lu, the latest winner of the Leeds International Piano Competition will then take centre stage for Chopin’s Piano Concerto No. 1 in E minor. Shostakovich’s astonishingly assured First Symphony lays out his youthful manifesto of where the symphonic form might go in the twentieth century, with an appreciative nod in the direction of tradition. 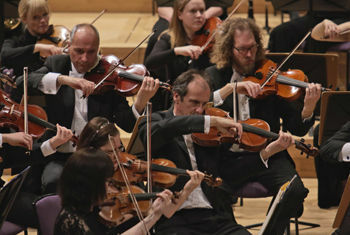 The season concludes with the Russian Philharmonic on Friday 24 May. One of the greatest Russian regional orchestras conducted by Thomas Sanderling performs two works by Tchaikovsky; his richly colourful and joyful Romeo & Juliet Overture and his Violin Concerto, performed by the acclaimed Alexander Sitkovetsky.